A social housing install in Ealing, West London. Credit: Solarplicity. The company revealed in June that, with the help of the Department for International Trade (DIT), it had secured investment from Dutch firm Maas Capital. Details released on Saturday confirm that Maas, part of the ABN AMRO Bank, will invest £160 million to unlock a total of £1 billion. This will then be used for a residential installation programme for 800,000 homes in England and Wales during the next five years and 100,000 in the next 18 months. “Today’s announcement is a reflection of our exciting growth in the energy market, backed by international capital investment through DIT,” said David Elbourne, CEO, Solarplicity in a statement. “Solarplicity is committed to reducing energy bills for both solar and non-solar customers. Equipping them with the latest smart technologies, and 100% renewable energy, they are guaranteed to save with our Fair Market Price,” he added. 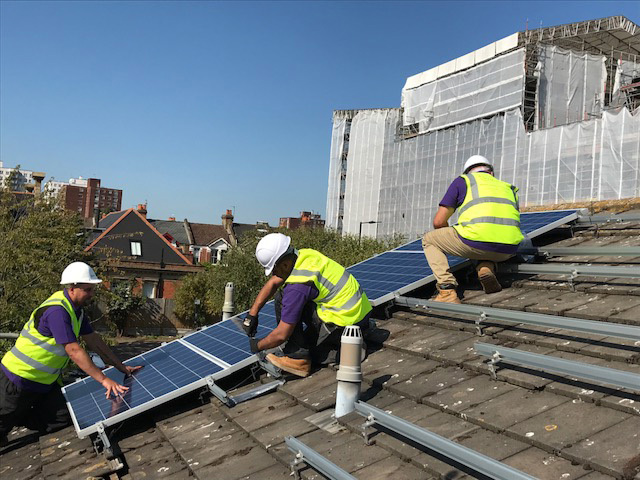 Solarplicity will work with social housing firms to create Community Energy Scheme’s offering tenants guaranteed electricity prices. Annual savings of £192 million compared to the Big Six’s standard variable tariff. Around 1000 installation jobs will be created with Solarplicity taking a leaf out of the US solar industry’s book and training military veterans in the necessary maintenance skills.